میرزایی, محمدرضا, محمودی, مهدی, حاجی‌زاده, محمدرضا, بگرضایی, فهمیده, بهرام‌آبادی, رضا. (1396). OCT4B1و نقش آن در مهار بیان ژن‌های خانواده TRAFدر رده‌های سلول سرطانی (AGS، 5637 و U87MG). سلامت جامعه, 9(1), 28-36. محمدرضا میرزایی; مهدی محمودی; محمدرضا حاجی‌زاده; فهمیده بگرضایی; رضا بهرام‌آبادی. "OCT4B1و نقش آن در مهار بیان ژن‌های خانواده TRAFدر رده‌های سلول سرطانی (AGS، 5637 و U87MG)". سلامت جامعه, 9, 1, 1396, 28-36. میرزایی, محمدرضا, محمودی, مهدی, حاجی‌زاده, محمدرضا, بگرضایی, فهمیده, بهرام‌آبادی, رضا. (1396). 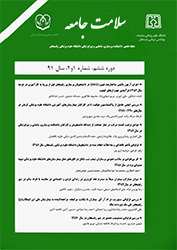 'OCT4B1و نقش آن در مهار بیان ژن‌های خانواده TRAFدر رده‌های سلول سرطانی (AGS، 5637 و U87MG)', سلامت جامعه, 9(1), pp. 28-36. میرزایی, محمدرضا, محمودی, مهدی, حاجی‌زاده, محمدرضا, بگرضایی, فهمیده, بهرام‌آبادی, رضا. OCT4B1و نقش آن در مهار بیان ژن‌های خانواده TRAFدر رده‌های سلول سرطانی (AGS، 5637 و U87MG). سلامت جامعه, 1396; 9(1): 28-36. مقدمه: OCT4یکی از ژن‌های مهم و تأثیرگذار بر مکانیسم خود بازآفرینی سلول (cell renewal) و هسته مرکزی مجموعه پروتئینی است که به‌عنوان عامل بنیادی بودن (Stemness) عمل می‌کنند. این ژن واریانت­های متعددی از پروتئین OCT4 را کد می‌کند که مشهورترین آن‌هاOCT4B1 است. این واریانت به میزان بالایی در رده‌های سلول سرطانی و نیز بافت‌های سرطانی بیان می‌شود.. آپوپتوزیس توسط خانواده‌های مختلف ژنی کنترل و انجام می‌شود و یکی از این گروه‌های ژنی خانواده TRAF (TNF receptor-associated factor) است که شامل سه ژن (TRAF1، TRAF2 وTRAF3 ) می‌باشد. اطلاعاتی در مورد تأثیر واریانت OCT4B1 بر بیان ژن‌های خانواده TRAF، در دست نیست، بنابراین هدف این مطالعه بررسی تأثیر مهار واریانت OCT4B1 بر بیان سه ژن خانواده TRAF می‌باشد. مواد و روش‌ها: رده‌های سلول سرطانی AGS (آدنوکارسینوم معده)،5637 (تومور مثانه) و U87MG (تومور مغز) در دو گروه تست و کنترل و با شرایط یکسان کشت و پس از رسیدن به تراکم سلولی موردنظر با استفاده از siRNA اختصاصی OCT4B1 (گروه تست) و scramble siRNA (گروه کنترل) مورد ترانسفکشن قرار گرفتند. پس از 48 ساعت RNA سلولی تخلیص و cDNA مربوطه سنتز گردید و با روش PCR Array، بیان ژن‌های موردنظر (خانوادهTRAF)، در هر رده سلولی و گروه‌های دوگانه تست و کنترل تعیین و بیان هر ژن با استفاده از نرم‌افزار اختصاصی شرکت SA Biosciences (RT) RTمحاسبه گردید. یافته‌ها: نتایج نشان داد تغییرات بیان ژنی در سه رده سلول سرطانی موردمطالعه تقریباً مشابه است و بیان هر سه ژن موردمطالعه، به دنبال مهار OCT4B1، کاهش معنی­داری را نشان می‌دهد. نتیجه‌گیری: طبق نتایج به ‌دست‌آمده، مهار OCT4B1 باعث مهار بیان ژن‌های خانواده TRAF و القاء آپوپتوزیس در رده‌های سلول سرطانی می­شود. بنابراین تأثیر مهار OCT4B1 بر فرایند آپوپتوزیس می‌تواند در مطالعات آتی شناخت مکانیسم ایجاد و درمان سرطان مورد توجه قرار گیرد. Introduction: OCT4 is one of the major genes for controlling cell renewal and is the core of the proteins that is known as stemness state.OCT4 encodes several variants, the most famous is OCT4B1.This variant has expressed in cancer cell lines and cancer tissues and has anti-apoptotic potency. Apoptosis has an important role in the pathogenesis of various diseases including cancer and autoimmune disorders. Apoptosis is regulated by different gene families; TRAF (TNF receptor-associated factor) is one of these families which consist of three genes (TRAF1, TRAF2 and TRAF3).There is little Information about the effect of OCT4B1 on gene expression of TRAF family; so, the aim of this study was to evaluate the effect of OCT4B1suppression on expression of TRAF family. Material and Methods: cancer cell lines AGS (gastric adenocarcinoma), 5637 (bladder cancer) and U87MG (brain tumor) were cultured in the test and control groups with the same conditions and were transected after reaching the desired cell density, using specific siRNA OCT4B1 (test group) and scramble siRNA (control). Cellular RNA was extracted and cDNA were synthesized 48 hours after transfection. Gene expressions of interest (TRAF family) were estimated by PCR Array method and the results were analyzed by RT software. Results: A gene expression alteration in studied in the three cancer cell lines were similar. Conclusion: According to the results, OCT4B1 suppression inhibits the expression of TRAF family and this induces apoptosis in the cancer cell lines. Therefore, OCT4B1 can be considered in the recognition of mechanism of cancer and also cancer therapy. Johnstone RW, Ruefli AA, Lowe SW. Apoptosis: a link between cancer genetics and chemotherapy. Cell 2002;108(2):153-64. Igney FH, Krammer PH. Death and anti-death: tumour resistance to apoptosis. Nature Reviews Cancer 2002;2(4):277-88. Clarke MF, Becker MW. Stem cells: the real culprits in cancer? Scientific American 2006;295(1):52-9. Clarke MF, Fuller M. Stem cells and cancer: two faces of eve. Cell 2006;124(6):1111-5. Reya T, Morrison SJ, Clarke MF, Weissman IL. Stem cells, cancer, and cancer stem cells. nature 2001;414(6859):105-11. Hyun JS, Tran MC, Wong VW, Chung MT, Lo DD, Montoro DT, et al. Enhancing stem cell survival in vivo for tissue repair. Biotechnology advances 2013;31(5):736-43. Jean C, Aubel P, Soleihavoup C, Bouhallier F, Voisin S, Lavial F, et al. Pluripotent genes in avian stem cells. Development, growth & differentiation 2013;55(1):41-51. Schöler HR, Ruppert S, Suzuki N, Chowdhury K, Gruss P. New type of POU domain in germ line-specific protein Oct-4. Nature 1990;344(6265):435-9. Takeda J, Seino S, Bell GI. Human Oct3 gene family: cDNA sequences, alternative splicing, gene organization, chromosomal location, and expression at low levels in adult tissues. Nucleic acids research 1992;20(17):4613-20. Lee J, Kim HK, Rho J-Y, Han Y-M, Kim J. The human OCT-4 isoforms differ in their ability to confer self-renewal. Journal of Biological Chemistry 2006;281(44):33554-65. Atlasi Y, Mowla SJ, Ziaee SA, Gokhale PJ, Andrews PW. OCT4 spliced variants are differentially expressed in human pluripotent and nonpluripotent cells. Stem Cells 2008;26(12):3068-74. Asadi MH, Mowla SJ, Fathi F, Aleyasin A, Asadzadeh J, Atlasi Y. OCT4B1, a novel spliced variant of OCT4, is highly expressed in gastric cancer and acts as an antiapoptotic factor. International Journal of Cancer 2011;128(11):2645-52. Barr PJ, Tomei LD. Apoptosis and its role in human disease. Nature Biotechnology 1994;12(5):487-93. Kerr JF, Winterford CM, Harmon BV. Apoptosis. Its significance in cancer and cancer therapy. Cancer 1994;73(8):2013-26. Cotter TG. Apoptosis and cancer: the genesis of a research field. Nature Reviews Cancer 2009;9(7):501-7. Fadeel B, Orrenius S. Apoptosis: a basic biological phenomenon with wide‐ranging implications in human disease. Journal of internal medicine 2005;258(6):479-517. Atlasi Y, Mowla SJ, Ziaee SA, Bahrami AR. OCT‐4, an embryonic stem cell marker, is highly expressed in bladder cancer. International Journal of Cancer 2007;120(7):1598-602. Seo K-W, Lee S-R, Bhandari DR, Roh K-H, Park S-B, So A-Y, et al. OCT4A contributes to the stemness and multi-potency of human umbilical cord blood-derived multipotent stem cells (hUCB–MSCs). Biochemical and biophysical research communications 2009;384(1):120-5. Gao Y, Wei J, Han J, Wang X, Su G, Zhao Y, et al. The Novel Function of OCT4B Isoform‐265 in Genotoxic Stress. Stem Cells 2012;30(4):665-72. Clapp C, Portt L, Khoury C, Sheibani S, Eid R, Greenwood M, et al. Untangling the roles of anti-apoptosis in regulating programmed cell death using humanized yeast cells. Frontiers in oncology 2012;2:59. Schteingart DE, Benitez R, Bradford C, Narayan A, Wang S. Expression of anti-apoptosis genes determines the response of adrenal cancer to apoptosis-inducing chemotherapy. Anticancer research 2010;30(12):4805-9. Yefu W, Yipeng Q, Ying Z, Zhida L, Yiran Y. Functional study on baculovirus anti-apoptosis genes. Molecular and cellular biochemistry 2003;252(1-2):103-8. Heeney MM, Ormsbee SM, Moody MA, Howard TA, DeCastro CM, Ware RE. Increased expression of anti-apoptosis genes in peripheral blood cells from patients with paroxysmal nocturnal hemoglobinuria. Molecular genetics and metabolism 2003;78(4):291-4. Bernier P, Parent A. The anti-apoptosis bcl-2 proto-oncogene is preferentially expressed in limbic structures of the primate brain. Neuroscience 1997;82(3):635-40. Beverly LJ. Regulation of anti‐apoptotic BCL2‐proteins by non‐canonical interactions: The next step forward or two steps back? Journal of cellular biochemistry 2012;113(1):3-12. Vogler M. BCL2A1: the underdog in the BCL2 family. Cell Death & Differentiation 2012;19(1):67-74. Rosati A, Basile A, Falco A, d'Avenia M, Festa M, Graziano V, et al. Role of BAG3 protein in leukemia cell survival and response to therapy. Biochimica et Biophysica Acta (BBA)-Reviews on Cancer 2012;1826(2):365-9. Chua CC, Gao J, Ho Y-S, Xu X, Kuo I-C, Chua K-Y, et al. Over-expression of a modified bifunctional apoptosis regulator protects against cardiac injury and doxorubicin-induced cardiotoxicity in transgenic mice. Cardiovascular research 2009;81(1):20-7. Rong J, Chen L, Toth JI, Tcherpakov M, Petroski MD, Reed JC. Bifunctional apoptosis regulator (BAR), an endoplasmic reticulum (ER)-associated E3 ubiquitin ligase, modulates BI-1 protein stability and function in ER Stress. Journal of Biological Chemistry 2011;286(2):1453-63. Oberoi-Khanuja TK, Karreman C, Larisch S, Rapp UR, Rajalingam K. Role of melanoma inhibitor of apoptosis (ML-IAP) protein, a member of the baculoviral IAP repeat (BIR) domain family, in the regulation of C-RAF kinase and cell migration. Journal of Biological Chemistry 2012;287(34):28445-55. Katagiri N, Shobuike T, Chang B, Kukita A, Miyamoto H. The human apoptosis inhibitor NAIP induces pyroptosis in macrophages infected with Legionella pneumophila. Microbes and Infection 2012;14(13):1123-32. AMH Z-H, BA Z. NAIP-deletion analysis in Malaysian patients with spinal muscular atrophy. Kobe J Med Sci 2007;53(4):171-5. Maier JK, Balabanian S, Coffill CR, Stewart A, Pelletier L, Franks DJ, et al. Distribution of neuronal apoptosis inhibitory protein in human tissues. Journal of Histochemistry & Cytochemistry 2007;55(9):911-23. Qin W, Hu J, Guo M, Xu J, Li J, Yao G, et al. BNIPL-2, a novel homologue of BNIP-2, interacts with Bcl-2 and Cdc42GAP in apoptosis. Biochemical and biophysical research communications 2003;308(2):379-85. Zhang H, Cheung P, Yanagawa B, McManus B, Yang D. BNips: a group of pro-apoptotic proteins in the Bcl-2 family. Apoptosis 2003;8(3):229-36.